Park by the roadside on the Bentham-Slaidburn road, near its junction with a minor road (Lythe Lane) leading west towards Lowgill. From the road junction, head north for 50 yards to a waymark post, then fork left off the road (the finger on the waymark post points too far left) across rushy grassland to a waymarked stile in a fence. Cross the stile and the next field, to another fence and stile. After this stile, head towards the left-hand of two small blocks of conifers ahead, to reach a wall stile in a partly-ruined wall. After crossing this, keep ahead, with a fence/ruined wall on your left, through an excavated area, to a stile 20 yards to the right of the field corner (and just left of where the barbed-wire ends). Cross this, and follow the fence on your left to a gate(way). Go through and continue in the same direction as before, with the fence on your right, to a gate/stile. Cross this, then a nearby ladder stile next to a forest corner. After this, aim for the next block of conifers, bearing right as you approach it, towards Craggs farm. Go through a gateway by the field corner, then through a green gate with a stile on its right. Go ahead to cross another stile by a green shed. Pass the shed, and a barn, on your right, and a house on your left. Keep in this direction, through (or over) two wooden gates, with another house on your left, then through a green gate. 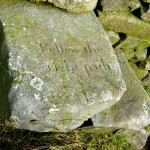 Turn left to a metal gate, after which, cross a track and pass a gate on your right, to a stile. Cross this, then turn right and follow the wall on your right to a wall stile in the field corner. Continue with a wall on your right at first, then diverge from it to follow a power line. Keep 20 yards left of the line to reach a wall stile just to the right of a thorn tree. After this, bear left, and follow the right side of a shallow valley down to a stile in a fence, where the fence crosses a wall. Now follow the fence on your right, with Croasdale Beck below, to reach another stile leading onto a road. Turn right across Lane Foot bridge, after which, turn left, and walk down the grassy field, with Croasdale Beck on your left. 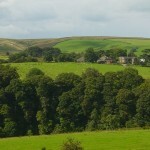 After a boggy stretch, you will reach the bottom corner of the field, where you will find a footbridge over the beck. 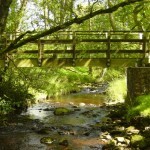 Cross the bridge, follow the path right for 20 yards, then turn sharp left, up to a stile. Cross into a field corner, then follow the fence on your right to some sheep pens. 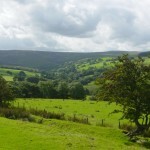 Go through a metal gate, and past the pens to a wooden gate and stile. Follow the path beyond through some gorse and continue, converging with the wall on your left, to a gate. After the gate, turn right and follow a track past the houses (Brackenbottom) and then left to a paved area. Bear right to go through a wooden gate by a power pole, then follow the fence on your left. When you reach the fence corner, bear slightly right to reach a wall stile just to the right of a length of fence ahead. After the stile, follow its instruction by turning right and following the wall on your right (a bit overgrown) until it becomes a fence. From here, turn left through some rushes, then follow the right side of a shallow valley, with a boggy ditch on your left, towards some woodland. When you reach the woodland fence, turn right (ignore a stile on the other side of the ditch) and follow the fence on your left to a stile. Cross the stile, and the footbridge just beyond, then go straight up the wooded slope to a stile just to the right of an oak tree. 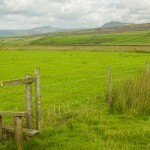 Cross the stile, then turn right and follow the fence on your right to another stile. Cross this, then follow a small path through woodland to emerge on a surfaced road. Turn left along the road to Ivah, keeping straight on at the junction, and continuing along the road for 300 yards to a sharp right bend. Just after the bend, turn left across a cattle grid, and follow the track beyond to Swans farm. Go through the left-hand gate, then turn right before a large barn to a gate. Go through and follow a muddy track up to another gate. After this, follow a faint grassy track, near a fence/hedge on your right, level at first, and then downhill to the field corner where you pass a boulder and cross a small stream before going through a narrow gate. 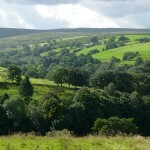 Keep ahead around the hillside, through an old gateway with a tall waymarked post on its left, to a short waymark post. From here, aim for the left-hand-most farm ahead, and head down to another short waymark post, after which aim slightly left of the farm, and go down to a narrow gate at the right-hand end of a wall. After the gate, turn right and head downhill through rushes to a footbridge over Whitray Beck. 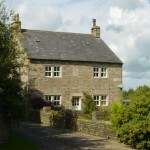 After crossing, head straight up the steep slope ahead, and when it eases, aim left of the farm to pass left of a wall corner, then follow the wall on your right to a gate, then a wall on your left to Whitray farm. Go through a gate into the farmyard, and keep ahead to reach a surfaced road. Turn left along the road and follow it for nearly a mile to a T-junction. Turn left here, and follow the road back to your starting point.